Well, summer’s here! The temp soared for the third ride of the LCC training season. Sunscreen and lots of water being the order of the day. Simon came out again this week with new faces Alex and Rob. To be fair Rob was actually pretty well known to Jim — being brothers ‘n all. Andy was also out today after last week’s Sportive diversion and keen for a good tempo in the perfect weather. After last weeks zippy ride with Jim, Simon seemed on for a quick one and Alex’s carbon steed suggested he’d be quick too. We headed off at a decent clip keeping the pace up, and as we headed out of Weybridge the pace warmed up further. It became apparent that Jim was serious about schooling his brother after an earlier urban commuting ‘loss’. Enjoying the quicker pace, Andy enthusiastically held the wheel at the rear. We had decided to stay on the official route and climb Newlands Corner. In the end the A246 traffic wasn’t too bad and Andy even found himself on the front pulling (he was tricked!). The climb up Newlands was marked by repeated ‘mechanicals’ for Andy which keep him behind Jim’s wheel until miraculously the problem sorted itself and Andy snuck though for an historic KOM. The team arrived quickly at the top and looked fresh. Jim resolved to work harder. A quick pic and bottle fill, and off the group shot toward an off-route coffee stop in Shere. Andy showed some decending skill, but no navigating skills by taking the wrong turn as usual. Coffee was great, with flapjacks, brownies and a huge ginger cake slice (for Alex, who may have regretted that choice later). 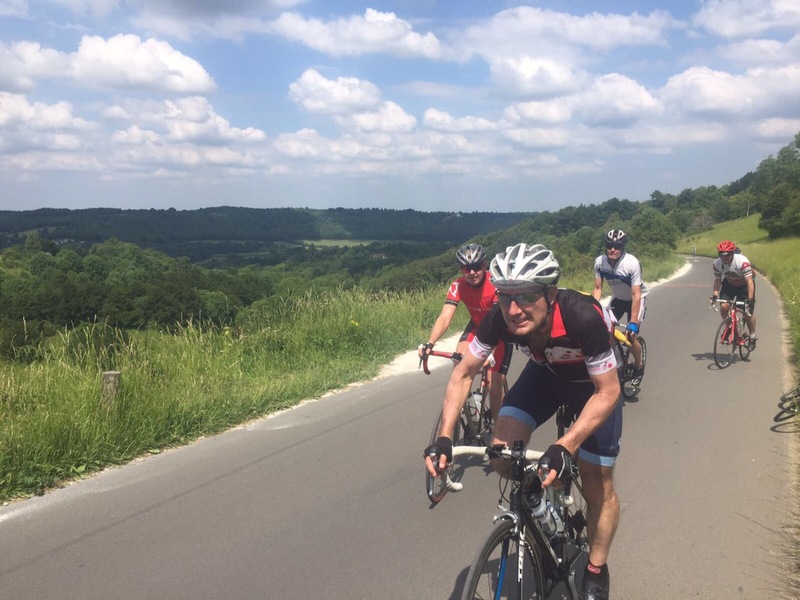 Soon the group were back on to the route and raced off to the bottom of Leith Hill. As Leith Hill is inclined to do, burn was duly dished out to the group as they steadily paced up the hill. At the top we all looked a little more knackered. Jim seemed cheerier. Andy ‘putting in 110%’ while Simon looks on in relaxed amusement. A fast decent into Dorking and a relaxed climb up Box for another bottle fill-up, finished the days major climbing. At this point our group were considering the wisdom of the morning’s pace. We decided to head ‘off-course’ to avoid traffic and head back to Kingston via Epsom. A beautiful, quick day out. By the end of the ride, Jim had exhausted his brother and we had a great training ride. Perfect!